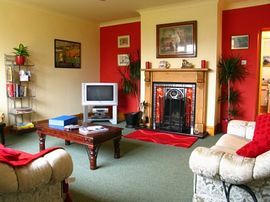 The Station Masters House is a delightful self-catering holiday home for up to 8 people. 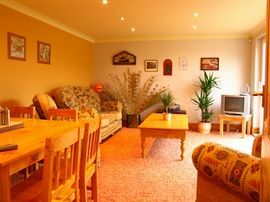 With 4 bedrooms, 2 bathrooms, 2 large lounges and a real log fire, everyone can relax in total comfort. Ideally located on the edge of the Lincolnshire Wolds yet only 10 minutes from the coast, The Station Master's House sits quietly on the corner of The Old Station Yard - a beautifully unique and quaint holiday arena that lies trackside The Lincolnshire Wolds Railway, a working heritage line with steam and diesel running days, steeped in character and history. The large kitchen windows overlook the track and there is a pure nostalgic joy to be had from watching and waving at the steam trains as they pass by. Even when the trains aren't running, the character and history exuded by this original station master's house are undeniably attractive. For groups of other sizes, you can also hire our super reproduction Railway Carriages. Each sleeping 2+2, our 3 luxurious Carriages never fail to delight! Spacious and modern, they still retain a quaint atmosphere by the subtle additions of authentic railway light fittings and a barrelled ceiling. Named after carriages on the Orient Express, Audrey, Cygnus and Ibis work their charm on children and adults alike. Hiring all 3 Railway Carriages along with The Station Masters House gives a truly unique holiday experience for large family gatherings or groups of friends of up to 22! The Old Station Yard also boasts a bespoke picnic area with barbecue hut, built-in Buschbecke BBQ and both indoor and outdoor seating. You can also choose to hire our children's bouncy castle or take the family for a day out on our comprehensive range of cycles. We have cycles and accessories to suit all including tagalongs, trailers and child seats for those too young to ride on their own. If you're feeling a little adventurous, you could choose our fun tandem or even one of our custom Penny Farthings! Surrounded by quaint villages, there is also a wide range and diversity of activities and attractions that abound in close proximity. From a day out exploring the historic Lincoln Castle to the thrills and spills of Pleasure Island theme park in Cleethorpes, there is ample for everyone. Welcome to Lincolnshire's Area of Outstanding Natural Beauty. Amazing open fire in our welcoming lounge. Bouncy Castle & Cycle Hire available. The sun lounge with dining area. One of our beautiful Railway Carriages. Ramped access. Ground floor twin room available with shower room & loo adjacent. All bed linen, duvets and pillows provided. Also 2 towels per bathroom and tea towels. Very well behaved and clean pets only please. Attractive Patio area along with pretty enclosed gardens. BBQ's available for visitors use. Adjacent to the heritage railway line The Lincolnshire Wolds Railway. Local Services: Nearest train station - Grimsby. The Old Station Yard is situated 800m east of the main A16 Grimsby to Louth road next to the railway crossing. Once you get to the A16, ignore all signs for Ludborough and take the only road that is signposted to Fulstow. We're the first buliding on the right, just before the Lincolnshire Wolds railway crossing. The nearest train station is Grimsby Town. This is only a short walk from the main bus station from where you can get a bus to Ludborough, an easy mile walk from The Old Station Yard. National Express operates daily services into Grimsby from London, Bristol, Birmingham, Leicester, and many other major cities and towns. Stagecoach operates a frequent service between Grimsby and Hull, Doncaster and Sheffield. Short break specials available off season. Peak season full weeks only. See our website or contact us for up-to-date rates and availability. 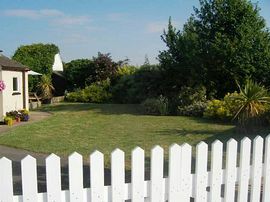 The Searston family of six from Nottingham wrote: "What a pleasant property and lovely area of Lincolnshire. We were fortunate enough to stay when the local railway preservation society had a steaming day - an experience all on it's own!! We'll definitely be coming back and wish you luck with your exciting adventure for the yard." The Barnes family from Lowestoft said: "The house and facilities are first class. Thankyou for your hospitality. We played host to some of our 'lost' relations of Lincolnshire in the property and there was sixteen of us for a barbecue and party. A real family reunion. We had to take a walk afterwards into the village of Fulstow and the local pub." Mr & Mrs Fogarty & family from Chester commented: "First class accommodation and surroundings. Good luck with your vision for the transformation of the yard, it'll be fantastic and we'll certainly book." The ramblers group from Horsham wrote: "What a pleasant change and a breath of fresh air to find an accommodation that suited all of our needs. The lovely Lincolnshire countryside and a roaring fire to come 'home' to with ample space for boots & rucksacks. Highly recommended to all walkers worldwide!!" The O'Reilly family from Dublin wrote: "The highlight of our stay was the bouncy castle - to have a bouncy castle was, well, like heaven for Damian & Maria and even we had a go ( briefly ) J Thank you so much for allowing us to stay in your lovely holiday home and we can't wait to come back and stay in a carriage. 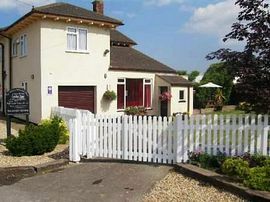 A friendly and attractive holiday home and area, we'll have no problem recommending to our friends." The Prendergasts from Suffolk said: "We are so pleased we took our friends recommendation to come to Lincolnshire. A choice of activities so well advertised by the literature in The Station Master's House, and what a beautiful property with real character. We were only disappointed we missed the steam trains and will make sure when we book again it'll be on a running day. The New Inn at North Thoresby had unbelievable meals at a very sensible price." The Brears from Sheffield wrote: "What a splendid house, great location, great owners. Lots to do and see. Plenty of wildlife in the garden. railway is great, a ride is a must. We loved it here and will certainly recommend and return as soon as possible. You really Must use the log fire!!" 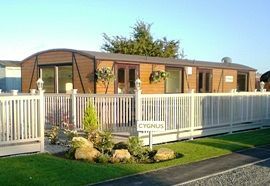 The Coot family from Ramsgate wrote: "Lovely accommodation. Made it a great weeks holiday, children enjoyed having a living room of their own. Definitely recommend it and will love to come back. Thankyou." The Strafford family enjoyed a stay in one of our railway carriages: "Our holiday in Audrey the railway carriage was a proper treat. Five star luxury and so much thought must have gone into the design. The setting was super and all the children want to know is when are we coming back. Thank you for a lovely break." Awarded Walkers Welcome and Cyclists Welcome accreditation by the ETB.